Most home appliances are designed to stand up to years of use, wear, and tear. After all, we use most of them every day and rely on them to be durable. But they’re not made to deal with abuse, misuse, and mishaps that can damage them and lead to costly repairs. Are you making these damaging and potentially dangerous mistakes? Learn about the most common appliance abuses and why you can’t put liquid soap in your dishwasher, open zippers in your washer, or too much food in your fridge. Not using a surge protector: Lightning strikes and other power surges can overload your appliances, causing problems like ruined temperature controls, motherboards, and outlets. Consider installing whole house power surge protection rather than relying on power strips. Packing your refrigerator too full: Forgetting to clean out the fridge can lead to a buildup of mold, but that’s not the worst thing that can happen. Too much food in your refrigerator makes it difficult for air to circulate and keep food cool enough. The motor will have to work overtime, and this can lead to excess wear, tear, and ultimately, failure that will spoil your fridge full of food. Make it a habit to regularly purge items every time you go to the grocery store. Filling the freezer too full: For the same reason, filling your freezer too full of food is bad news. It can block your freezer vents, causing your refrigerator motor and condenser to work harder than they need to, which can cause them to burn out. Not cleaning the refrigerator’s condenser: The condenser coils of your refrigerator probably aren’t the first spot in your house you think to clean regularly, but they need to be a part of your routine, however gross they are. If you allow your refrigerator’s condenser to get clogged, your refrigerator will have to work harder, using more electricity and wearing on the appliance. Be sure to clean your condenser about every six months. Not replacing water filters: Water filters keep mineral buildup from reaching your water, and need to be replaced regularly. If you don’t you could have clogs, leaks, and poor quality water. Moving your refrigerator improperly: Laying your refrigerator down can cause oil from the compressor to get into cooling lines and prevent proper drainage, causing your refrigerator to not be able to cool. Moving your refrigerator while full can put stress on shelves and drawers, as well. Abusing your garbage disposal: Garbage disposals are so convenient, and sometimes, it seems like you can throw anything down there and have it disappear. But some items are too rough on your garbage disposal and can lead to damage or even jam it beyond repair. Be careful not to put grease or oil down your disposal, as well as other items including coffee grounds, shells, celery, and bones. Flushing with hot water: Hot water is good for washing dishes, but cold water is best for grinding food in your garbage disposal. Hot water melts grease and fat, and can cause mechanical damage and clogged drain lines. Not cleaning your garbage disposal: Your garbage disposal needs help to keep working properly. Flush your disposal with a sink full of cold water, a cup of ice cubes, and salt to keep it working well. Otherwise, you may see its chopping efficiency decrease. Using the wrong soap in your dishwasher: Dish soap and dishwasher soap both clean dishes, but they’re not the same. Dish soap does not belong in the dishwasher, and if you fill your dishwasher’s soap container with it, you’re likely to be in for a major bubble machine in your kitchen. Avoid this problem by only using soap that’s made specifically for your dishwasher, and nothing else. Leaving zippers unzipped: It’s easy to miss, but important to catch. Left open, zippers can catch on your washing machine’s drum, causing scratches, and even potentially causing glass panels to crack or explode. Not to mention snagging clothing. Before starting your load, pull all zipper tabs all the way to the top, and do the same with bras and lingerie or other clothing with hooks. Leaving coins in your pocket: Just like zippers and hooks, coins can seriously damage your washing machine, and often with more force. Be sure to check pockets before putting clothes in the washer. Not replacing washer hoses: After a few years, washing machine hoses can become brittle, eventually breaking and causing water damage. Be sure to inspect your washing machine hoses regularly, at least once a year, and replace them after 4 to 5 years. Using too much detergent: More soap means cleaner clothes, right? Wrong. Using too much detergent can leave soap residue that not only makes your clothes dingy, it can damage your washing machine’s control panel. Carefully measure your laundry detergent to make sure you’re not using too much. Using the wrong detergent: If you’re out of detergent and need to put in a load, it’s tempting to sub in a different kind of soap until you can make it to the store. But alternative soaps like dishwasher detergent can damage your machine. Avoid the temptation, and wash with water only if you have to. Overloading your washing machine: We all like to save time and conserve energy by washing full loads in the washer, but be careful not to overdo it. Putting too many clothes in your washer at once can overload the bearings and suspensions. Be sure to check your machine’s fill capacity. An unbalanced load can cause similar problems, so wash similarly weighted items together, such as heavy things with heavy things, and light things with light things. Not cleaning the lint trap or dryer vent: Cleaning the lint trap is easy, and you should be doing it every time you put in a new load. Forgetting this task can seriously interfere with dryer performance and safety — and can even cause a fire. But don’t forget about the dryer vent, either. If your dryer vent becomes clogged, lint in your vent could catch fire. Use a vent cleaning brush to clean your vent hose at the back of your dryer every six months, and if you have access to it, clean the vent as well. Never cleaning your washer: Hair and other debris can build up in your washer and lead to clogs. Run cleaning cycles on your washer, and if you have a front loader, wipe down the door area to avoid odors and buildup. Leaving wet clothes in the machine: Clothes aren’t meant to sit wet in your washing machine, and doing so can lead to a build up of mold on your clothes and washer. Be sure to take washed loads out immediately and put them into the dryer. Not cleaning or replacing filters: Filters help to keep your air conditioning unit working efficiently. Not replacing them monthly can cause your HVAC to struggle and wear unnecessarily. Not cleaning units: Your air conditioner and furnace collect dust, hair, and debris, and that can seriously interfere with performance. Remember to clean your units after every season to help your air conditioner and furnace keep up. Using an oven to heat your home: Ovens are designed to heat the inside of the oven only, not a room or an entire home. Using your oven this way is dangerous, and can put you at risk of burns. It also puts wear and tear on oven parts and controls. Not catching spills: Everyone has messes in the oven, but leaving spills can cause damage to your heating coils. With spills, you can break or damage heating coils. Place a layer of foil on your oven rack, and clean up spills as soon as your oven has cooled. Letting the vacuum cleaner bag get too full: It’s a pain to stop and dump out the vacuum cleaner bag before, after, or during your vacuuming, but it’s important. Let the bag get too full, and your vacuum will strain to pick up debris from the floor. All that strain can really damage your vacuum and shorten its usable life, so be sure to clean out the bag before each use, and keep an eye on its level while you’re using it in case it gets full. Using the wrong light bulb wattage: When it comes to lights, brighter is better, right? Not necessarily. Lamps or light sockets have a wattage limit that tells you the light bulb wattage you can use and still be operating safely. If you use a light bulb with a wattage that’s too high, it will use more power and get hotter, potentially overheating or causing a fire. Before screwing in a light bulb, be sure to check for the correct wattage. Leaving the toaster plugged in: There’s a small risk of spontaneous fire when your toaster is plugged in, so be sure to unplug it when you’re not using it. Never cleaning the coffee maker: Mineral deposits in your water can lead to build ups in your coffee and create clogs. Clean your coffee maker monthly with a full descaling to keep it in good working order. It’s also a good idea to use water that has had the minerals filtered out. Overloading the bread machine: Using standard measuring cups and spoons is important when you’re using a bread maker. Not only do you risk not having your bread turn out properly, you could start a fire. Overloading the machine could cause rising dough to reach the heating element and catch on fire. You should also regularly clean the bread machine to avoid fire from debris as well. Placing appliance cords in inappropriate areas: Appliance cords can be dangerous. You should avoid trips and falls by never placing an appliance cord in a walking area, and gathering extra cord behind appliances. Additionally, it’s important to not allow electrical cords to sit over a sink or come into contact with water or other liquids, as this can cause electrocution. Do not run cords under rugs, and never use an extension cord for appliances. Plug directly into an outlet instead. Using an appliance with a damaged cord: Any appliance with cord damage is an electrocution and fire hazard. Never use an appliance with a melted plug, exposed wires, or frayed cord. 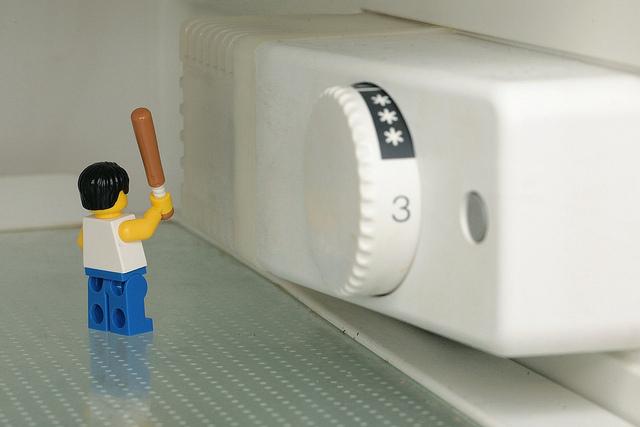 Are you guilty of any of these serious appliance abuses? Change your ways today, or you may have to pay for costly repairs tomorrow!